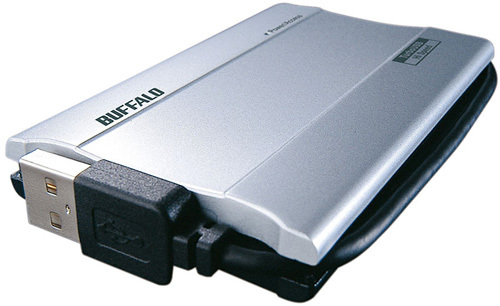 Buffalo SHD-UHRS 100GB External SSD | OhGizmo! I’ve been enjoying my Asus EEE PC for the past few weeks now, but filling up its 4GB drive that was already over half full with the OS wasn’t difficult. So I’ve been on the hunt for a considerably larger external USB drive that’s compact and won’t drain my battery. The good news is that this new 100GB SSD external drive from Buffalo perfectly fits the bill. It has an integrated USB cable and when you compare the size of the USB connection to the rest of the drive, it’s obviously a lot smaller than even a 2.5 inch notebook hard drive. The bad news is that we’re still in the infancy of SSD storage and this drive will set you back about $885, which is tough to justify when you can buy 2 more EEEs for that kind of money.